The Vigor2100V is a user-friendly broadband router with a built-in Voice over IP (VoIP ) telephone port. 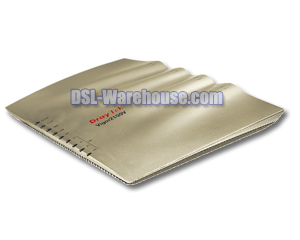 The DrayTek Vigor 2100V is a wireless broadband firewall/router which is ideal for sharing your Cable / DSL Modem between several PCs. The DrayTek Vigor2100V has a built-in Voice over IP (VoIP) telephone port, firewall facilities and VPN capabilities. 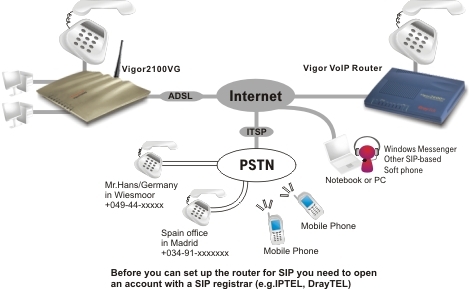 The phone port enables you to use your existing broadband connection to make VoIP calls to any other SIP/VoIP compatible device, virtually anywhere in the world for FREE. If you have an existing service You can make/receive calls while drastically reducing your phone bill. Here are a few sample applications where the DrayTek Vigor2100V is a perfect fit! The Vigor2100V lets you make the jump from dial-up to broadband but also provides the value added features of VoIP to help you make the most from your broadband line. VoIP calls over your cable/xDSL broadband connection can be made to any other compatible device, anywhere on the Internet and anywhere in the world, free of charge. By using an Internet Telephony Service Provider (ITSP), you can also make calls to any traditional phone line (landline or mobiles), as well as receive calls from anyone. The Vigor2100V's firewall provides the ideal balance of ease of use and security to help protect your network. The Vigor2100V series router has an email detection feature for notifying users that your POP3 mail server is holding email by lighting an 'email' LED on the front panel of the router without having to turn on your PC or check your email software. The Vigor2100V lets you make the jump from dial-up to broadband but also provides the value added features of VoIP to help you make the most from your broadband line. VoIP calls over your cable/xDSL broadband connection can be made to any other compatible device, anywhere on the Internet and anywhere in the world, free of charge.